We put 7 of the best climbing pants on the market through their paces. It came down to a photo finish, but the prAna Stretch Zion Pant (women’s counterpart: prAna Halle Pant) managed to stay our top pick for the third year in a row. 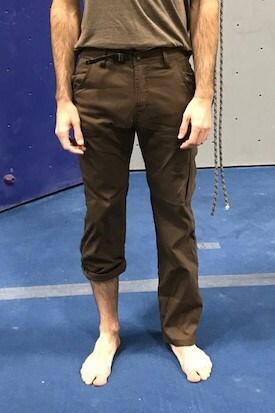 Climbing puts unique demands on clothing, especially once real rock gets involved. Pants need to be mobile, breathable, well-designed, and ideally versatile. The growing demand has spun climbing pants into a genre of their own, related to (but distinct from) more general hiking and travel pants. To be frank, you can’t go wrong with most of the pants in this test. With the exception of one, I’d be happy adding any of these pants into my wardrobe. Choosing the right pair comes down to where you’ll be climbing and what your needs are. For details, read on. The 7 pairs of climbing pants we tested. Simply put, the time-tested prAna Stretch Zions remain the best pick for the most climbers. They’re not perfect, but they tick almost every box for a general climbing pant. The biggest of those boxes is mobility. The Zions move exceptionally well, offering plenty of stretch without any restriction or binding. They don’t ride up or bunch, either, which is a blessing not all these pants share. The next best thing about the Stretch Zions is the features. This is very clearly a pant designed for climbing. A spacious thigh pocket stays out of the way of leg loops, and well-placed cuff snaps add ventilation and free the ankles. The Zions include an integrated belt, which sits flush and doesn’t abrade under a harness. Personally, I like having built-in adjustability — my waist changes size through the day, and I enjoy not having to worry about a separate belt. The Zion’s belt shows a touch of slippage over time, but with a good fit it’s fine. The Zion’s integrated belt makes adjusting the waist a cinch. Although the Stretch Zions excel on the wall, they work well around town as well. I wore them biking, hiking, stretching, and walking, and they never felt out of place. They’re not the most fashionable pants in this test, but they’re far from the most egregious. The Zion’s biggest weaknesses are minor ones: breathability and weather-proofing. 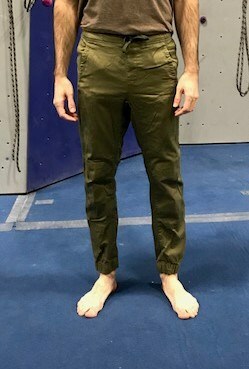 I found the pants to be breathable enough for 90% of situations, but in hot temperatures or under high exertion, they don’t vent as well as lighter fabrics like the Ferrosi. Likewise, the weather-proofing is adequate but not exceptional. Still, for the majority of days, the Stretch Zions are the right pant for the job. If you’re only buying a single pair of climbing pants, these are the ones to get. 99Boulders owner and editor Alex Beale has owned his personal pair of Stretch Zions for over three years. He’s put them through the ringer, from hiking in Ecuador to sport climbing at the Red River Gorge. They’re incredibly durable, he says, and notes that his pair still shows virtually no wear and tear despite being scraped against rock and plastic countless times. 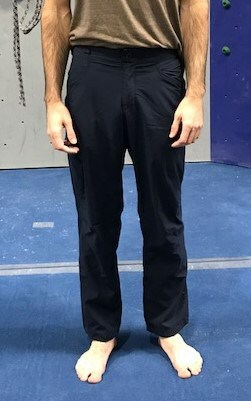 He’s a big fan of the integrated belt and cuff snaps, the latter of which he uses to keep his pant legs rolled up while climbing. The zip thigh pocket is the perfect size for carrying a phone up a route to take some photos at the top. Alex recommends the Zions to anyone looking for a versatile climbing and outdoors pant. They’re pricey but he thinks they’re worth it. 99Boulders owner and editor Alex Beale bouldering in the Stretch Zions. The Ferrosi Jacket is a well-respected softshell in its own right, but we think the pants deserve their own acclaim. The best part about the Ferrosis is their feel. I hardly noticed these pants while I was wearing them. The fabric is thin and light, with impeccable mobility and the best breathability in the test. I found these pants nearly as comfortable as a cozy pair of sweatpants, while remaining as light and mobile as a pair of gym shorts. In a remarkable paradox, the Ferrosis are as protective as they are airy. Bombproof and durable, the fabric is light but impressively weatherproof. I wore these pants out for a chilly day of sport climbing and found them surprisingly warm. 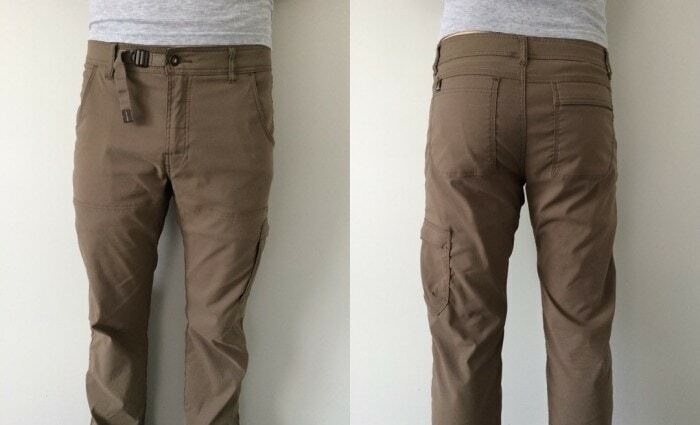 As an additional bonus, at $79 retail as of this writing the Ferrosi pants are on the cheaper end of the spectrum. The difference isn’t huge, but especially if you can find them on sale, the Ferrosis offer excellent value. The sole downside to the Ferrosis is the lack of extra features. The leg cuffs have a cinch system, but it’s not as effective as other pants. The waist is non-adjustable and may require a separate belt. The design is simple, without any unnecessary frills or features. On the plus side, the thigh pocket is functional and nicely sized. Given their technical focus, the Ferrosis aren’t the most fashionable pant. They’re not bad looking, but it’s clear that they’re aimed at the outdoors. We doubt most climbers will mind. For those reasons, the Stretch Zions pulled just ahead in final all-around scoring. Especially as an outdoor pant, however, I’m convinced that the Ferrosis are hard to beat. They’re worth a look for missions and climbers of all types. The Axiom jeans faced some unexpected competition for the title of most fashionable climbing pant, chiefly from the crisp Mountain Hardwear AP Pant. But in the end, fitted and stretchy jeans offer an easy style that’s hard to match. Where the Axioms excel is mobility. I didn’t mind climbing in these pants any more than the nylon and cotton fabrics, which is impressive for a denim pant. The diamond-gusseted crotch is freeing, and the legs have just the right amount of stretch. I felt just as confident high-stepping on a boulder problem as I did walking around town. The other obvious strength is the looks. Sized properly, the Axioms have a straight but fitted cut that sits nicely and looks sharp. No one I know was able to pick out these jeans from non-climbing jeans, and it’s nice to walk straight from the street to the gym. That said, the Axioms aren’t as comfortable or versatile as dedicated climbing pants. The legs fit closely (rugby players and power squatters should look elsewhere), and the waist area is more constricting than some models. Weather-proofing is (predictably) mediocre, and the jeans aren’t quite as comfortable out on the trail. While the Axioms are still impressively durable, the denim abrades more easily than other fabrics. As a result, I wouldn’t recommend the Axioms as a serious outdoor climbing pant. But if you need pants that can pull double duty at the gym and the pub, the Axioms are perfect. A minor note: sizing on the Axioms (and other prAna pants) runs large. When in doubt, size down a little. Movement in the Axiom jeans is free and easy. These pants deserve an honorable mention in this test. They weren’t quite strong enough to take home any awards, but they were among the most versatile pairs. What surprised me about the AP pants is the looks. Although the fabric feels durable and technical (weather-proofing and warmth are strong), these pants look nearly like a pair of slacks. I wouldn’t wear them to a business dinner, but they’re confident and unassuming around town. Features are also strong. The velcro thigh pocket blends in cleverly with the seams, and having two zipped rear pockets is a nice touch. One particularly nice detail is the reflective strips inside the calves — when the cuffs are rolled up and snapped into place, the strips face back and out. It’s a nice detail for cyclists and hikers who might be on the move after dark. The waist belt isn’t adjustable, but a close fit meant that the APs never moved around. Sadly, the fit is also the AP’s Achilles heel. The stiff fabric meant that the pants rode up more than I would have liked. Mobility was never restricted, but I found myself having to readjust after lowering off of routes. It’s not a deal breaker, but it’s noticeable over time. And while the fabric looks excellent, it’s a tad less comfortable and breathable than our award winners. The mobility was enough to keep the AP from winning an award, but it’s an excellent pant. For climbers who want an all-around technical pant that still looks presentable, it may be the best option. The Patagonia RPS are good pants — they’re just not great. Mobility and breathability are good, but not perfect. The RPS are comfortable, but not as pleasant as other options. The features are practical and well-designed, but they don’t stand out. As an all-around rock pant, it’s hard to complain about the Patagonias. They get the job done. The fabric is durable and protective, and all the elements are well designed. My only substantial complaint is the cuff system, which has a cinch but couldn’t keep the cuffs above my ankles or calves when necessary. But I found it equally hard to really love the RPS pants. In almost every area, another pair of pants was superior. The Zions are more mobile. The Ferrosis are more comfortable. The Axiom jeans and AP pants are better looking. And, at $89 retail, the RPS pants can’t even claim to be a budget option. As a result, the Patagonias finish in the middle of the road for our test. I certainly wouldn’t blame anyone who bought a pair, and Patagonia’s reputation and repair service make the deal a little sweeter. But the RPS pants would rarely be my first recommendation. Another unusual entrant, the BD Notions use a soft cotton construction with a drawstring waist. There are no zip pockets, and the cuffs are simple elastic. Indoors, the Notions feel at home. The stretch cotton feels nice and moves easily. I could do yoga in these pants just as easily as climb, and the drawstring made adjustability easy. Breathability is good, and comfort is top notch. But there the versatility ends. The Notions were the least weatherproof pant in the test, and they seem the least durable to boot. Outside, the lack of a zip pocket is inconvenient. These seem more like streamlined sweatpants than honed climbing pants. That’s not necessarily a bad thing, and the Notions were among the more comfortable pants in the test. But they seem best suited to climbing indoors and would only be suitable for milder outdoor missions. That said, there’s an argument to be made for the Notions as urban do-it-all pants. They’re not bad for cycling, excellent for activities like yoga or stretching, and comfortable cranking out workouts at the bouldering gym. I’m personally not a big fan of the styling, but some of my friends were. For those whose exercise takes place out of the elements, the Notions may be a worthy addition. Included as a budget option in this test, the Carhartts were woefully outclassed. From start to finish, the thick work pants failed to match the competition. The biggest complaint is mobility. The heavy fabric doesn’t stretch at all, and the fit isn’t forgiving enough to allow a full range of motion. Climbing was generally unpleasant, and breathability is poor. Looks are equally bad. One friend compared these pants to waders, and the likeness isn’t too far off. The Carhartts balloon around the thighs and calves with a cut that does little to flatter the wearer. There are no fewer than six pockets, but none of them have closures. Comfort isn’t even particularly good. The Carhartt’s one virtue is durability. Designed as burly work pants, this pair seems indestructible. That’s reassuring, although I wouldn’t want to climb in the Carhartts long enough to put it to the test. The one venue where these pants might make sense is off-width climbing. Mobility is less important, and all-out durability is the name of the game. For those climbers who love the wide, Carhartts will hold up well. But we’d still suggest looking at one of the more versatile options. At just under $40, the Carhartts are the cheapest pants in this test, but they’re still hard to recommend. Utility pockets aren’t much use, but the hammer loop could hold some extra gear? Most climbing pants follow the same basic design: take a mobile and durable pair of pants, then add pockets and even more mobility. Movement is the most important part of a good climbing pant, but comfort and useful features are critical as well. The major differences in pants come down to a few major details. The pants in this test have a wide range of fabric types and blends, and each behaves differently. The two main materials are nylon and cotton. Nylon is lightweight, breathable, and elastic. It also dries quickly. Cotton is soft and breathable but generally not as durable. If breathability is important to you, choose a lighter pant like the Ferrosi or Notion. If functionality is key, check out versatile and protective Stretch Zions or AP pants. Fabric also changes the fit. Whenever possible, try pants on in person, although many online outlets offer return or size-swap options. All these pants have at least two hip pockets and two in the rear. Some pants use zippers on the rear pockets, which is either a pain or a useful bonus, depending on who you ask. One important pocket for many climbers is the thigh pocket. On most climbing pants, this pocket adds a closure system and creates a place to stash something like a phone while climbing. It stays out of the way of a harness and keeps valuables safe. The Zion, Ferrosi, AP, and RPS pants all have dedicated thigh pockets. The Carhartt pants have two thigh-mounted utility pockets, but neither has a closure system. 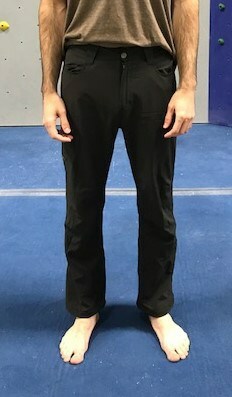 A couple other features set apart some climbing pants. A cuff system keeps leg cuffs out of the way when necessary. This can be for ventilation, or just to give the feet and ankles extra room. Some climbers like to be able to see their feet without any flapping fabric in the way. The Stretch Zion and AP pants both have cuff snaps, while the RPS and Ferrosis have cinch systems. The remaining pants may roll their cuffs up but do not have any closure system. Finally, consider whether you prefer an adjustable waist. The Stretch Zions and RPS pants have an integrated belt, and the Notion pants have a drawstring. The rest of the pants must work on a precise fit or be teamed with a belt. Reflective strips on the cuffs are a nice touch. Bouldering in the Mountain Hardwear AP Pants. To begin, I put all these pants through their paces at the gym. Later, I took them out bouldering and sport climbing in chillier weather to test warmth and weather-proofing. In between climbing excursions, I used them for as many other activities as I could imagine: hiking, biking, yoga, stretching, or just simple walks around town. How well could I move in the pants? Was there any restriction or resistance? How comfortable do I feel in the pants? How often do I feel clammy or stiff? In how many different venues can I use the pants? How easy or hard do they make my life?